Continuing in our series of inexpensive DIY spindle projects, today’s directions on how to make a drop spindle come from one of our favorite spindle gurus, Abby Franquemont. Abby has access to the best spindles anywhere, yet I often find her teaching someone how to use a drop spindle with one of these. They’re easy as can be: All it takes is a dowel for a shaft and a toy wheel for a spindle whorl. You can also make a drop spindle using a dowel and CD. Pros of a toy wheel spindle: Utterly easy to make; no fussing with a hook; surprisingly stable and functional. Cons of a toy wheel spindle: Usually set up as a low-whorl spindle, it requires a half-hitch. If you’d rather make an inexpensive spindle than buy your first, it’s easy to make a functional spindle with a toy wheel and dowel, supplies from a local craft or home-supply store. Toy wooden wheels come with holes pre-drilled in them, and dowels can easily be found in the same sizes. 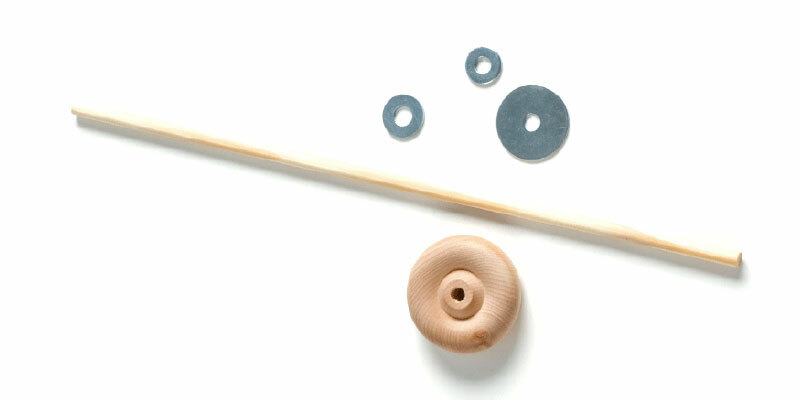 Make sure these match up; if your toy wheel has a ¼” hole, you will need a ¼” dowel 8″–12″ long to make a spindle. Simply put the toy wheel on the dowel. It will likely be a snug fit, and you may need to pound to get the dowel all the way through. That’s fine; you want it to fit tightly enough that the wheel does not slip off. Place the wheel about 1″ from the end of the shaft. If you would like to use this spindle with a low whorl, you’re all set! You may wish to sand the spindle lightly to remove any rough spots that could catch your fingers or your yarn. If you would like the spindle to be a bit heavier, slip one or more washers onto the shaft above the whorl. To read more of Abby’s spindle spinning tips, check out her book, Respect the Spindle.